I took the oldest Monkey Boy shopping to pick out fabric for his own quilt. I had so much fun and loved every minute of it! 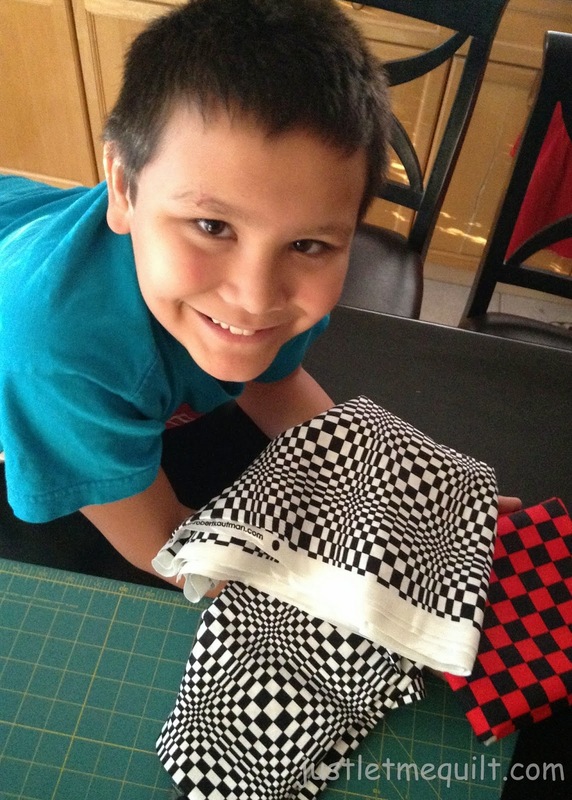 He's very creative and put his full attention into what fabric he wanted. We walked around Quiltique looking at the quilts on the wall to get ideas for a design. so he could pick out the fabrics for each portion of the quilt. It was no surprise that he zoomed in on fabrics in reds and blacks since he loves those colors. I think he was pretty excited about it, too! crazy white and black fabric is Night and Day by Robert Kaufman. The solids to go with it are by Robert Kaufman...I love that Kona! He drew a design for a label so I can embroider it. 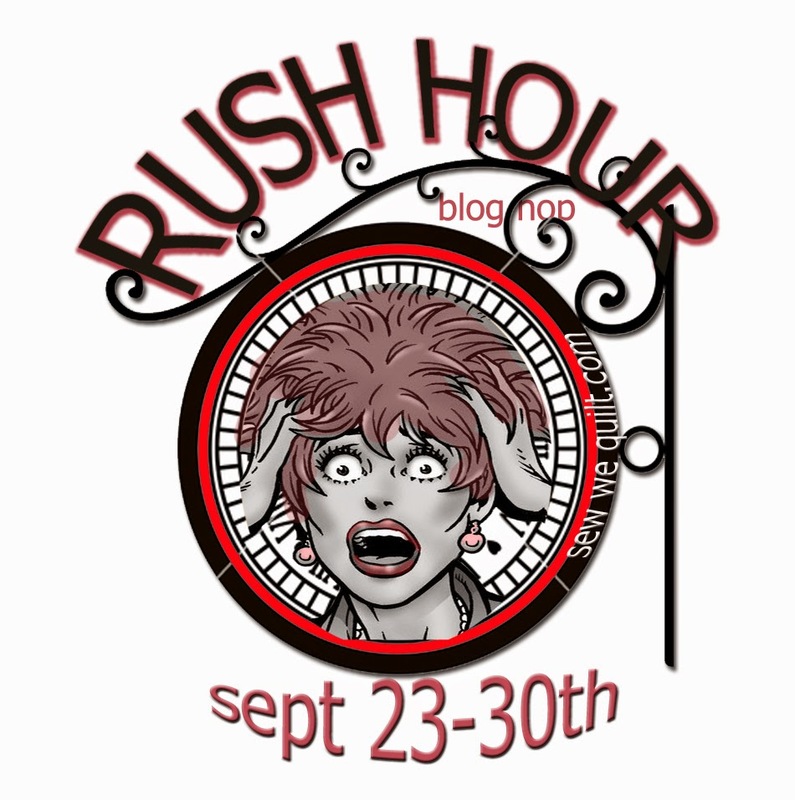 The fabrics he chose in his favorite colors would be perfect for the Rush Hour blog hop! That's really cool that he choose his own fabrics. Every time I take my grandson with me he goes to Thomas the train, we just bought some the other day he wants a basket for his hot wheels, not sure what he means. I can't wait for him to out grow this stage, he's only 4. What a great idea for having him help choose the fabric and draw the label. He is a cutie! Hi!!! Too fun!!! Those would be great for Rush Hour!!! I love his design for the label!!!! Future artist!!!! Love the black and red - he has great taste, just like his momma! And what a great idea to embroidery his drawing for the label :) Can't wait to see how it turns out! That is an aWESome way to get kids excited about a quilt....he will cherish this quilt and remember the experience forever ! Not to mention he picked out great fabrics! I bet your his favorite Grandma ! I love those great zippy colors! Can't wait to see the finished quilt. My nephews asked for quilts a few years ago. One wanted black and white with lime green and the other chose black and white with orange. Not what I would have chosen, but they came out great. He is adorable.Fun pic and can´t wait to see it finished! Good eye for colour he must have got that from his Grandmother. Will look forward to seeing finished product. It's those special moments we always remember. That will be the BEST quilt label. Great idea! It sounds like you had such fun together! I love that your are embroidering his drawing for the label! we both would get a long, he has such fine taste..great design there too..he needs a machine so he can start stitchng> ?